;# THE DEALER HAS AN EDGE. If you win as much as you lose, all player balances will gradually decrease making the 'finish' impossible to reach. ;# to compensate, you can award points for draws, and reward more money for a win than you take away for a loss. The same applies for doubles. ;# Bonus payouts. N card tricks represent an auto-payout if a player's hand consists of N cards. set to 0 to disable, otherwise set to the amount which should be paid out. ;# House rules. 'decks' can be from 2-8. The other lines respresent rules which can be used in the game. To "activate" a rule, change the 0 to a 1.
;# AI opponents. Just seperate the names by spaces, if you want to add more. ;# the intelligence levels correlate to the names, so Jess matches 6 and Kyle matches the last 1.
if ($3 !isop $1) .notice $3 You must be an operator to stop a game! else .notice $3 The game will end after the current round! else .notice $3 You can't perform this action now! elseif ($nick !isop $chan) .notice $nick You must be an operator to abort the games termination! elseif ($istok(!coins.coins,$2,46)) .notice $nick These will send a message with total user coins. Define a user (not AI) by simply specifying a username. elseif ($istok(!commands.commands,$2,46)) .notice $nick This will notice you a list of commands.... silly! if ((%d) && ($numtok($hget($g($1,1), $2), 32) > 2)) && (!$doubleWith3orMoreCards) .notice $nick You can only double with the first two cards! else .notice $2 You can't draw anymore cards! else .notice $2 You can't perform this action! if ($noResplitWithAces) && ($gettok($gettok(%hand,1,32),2,95) == A) && ($hget($g($1,2),$2)) .notice $2 You can't split Aces more than once! if (%s == %minimum) msg $1 $c2(%p) is on $cb3(The Edge) with $+(04,%s,) coins! msg $1 Nobody has joined the game. $c2(1 player) is required! Turning off. msg $1 $cb3(%a) replaces $c2(%user) and joins the game! ; these coins are displayed by the !coins command, removing them will be reflected. ; echo -a $1 finished the game, $iif($2 >= 0,winning,losing) $2 coins, and now has $3 total coins! ; also remove N stars worth of coins from the coin bank. Why am I seeing these symbols instead of hearts, clubs, spades and diamonds in your print screen? Is there a way to fix this so i can view the nice symbols? Thanks I will give the update a try. BTW....the game is awesome. You did a great job. I was able to see it thru a liteirc platform and thru mibbit and it looked great. Kudos to you! I kept editing this post so I sorted it into sections. Does it keep a tally of how many total coins (games x 150 coins) that you've won? You should also give 2nd and 3rd place coins too! And maybe coins can be used to by items for the game or just to show off what you've bought? (Not sure how coins are actually used or work in the game, maybe now it just works off the stats and coins are just used to win a round). This script is so awesome. Thanks for making it and thanks for updating it so quick! We've wanted a decent Blackjack script for so long. This is epic. Edited about 3 hours after original post. The source has been edited. I've done most things for you. Okie day. I suspect the directory isn't being constructed properly because you're using an older version of windows which does not let you create a folder named: stats\blackjack, if a folder named stats\ doesn't already exist. I now create the directories piece by piece, so it should be working. I'm also using mIRC version 7.46 if it helps. PROCESSCOMMAND.STATS Unknown command <-- I have no idea how you get this. Maybe it was related to the malfunction within the directory structure. If you still get random errors like this, let me know. It's very hard to diagnose without a line number though. About !pause. Each round, everyone has 30 seconds to complete their actions. Rounds conclude after all players have made their actions, or time is up. If Player A splits his hand, then the most hands per person is Player A with 2 hands. This adds 10 seconds to the clock, so now all players have 40 seconds. If Player B makes 3 splits in the same round, he now has the most hands with 4, so 30 seconds are added to the clock instead of 10. Each additional 'layer' of splits any of the active players reach, 10 seconds are added, but if ALL players reach the next layer, it's still just 10 seconds which are added. The statistics - maybe i wasn't so clear in my explanations here. Firstly, there are flags. -u indicates a user, -a indiciates AI. If you specify -u, and no user under the name is found, it will try to resolve an AI opponent under this name before indicating no users are found. Here are some things you can do with user stats / top 5 lists / comparisons. Finally, the use of coins. 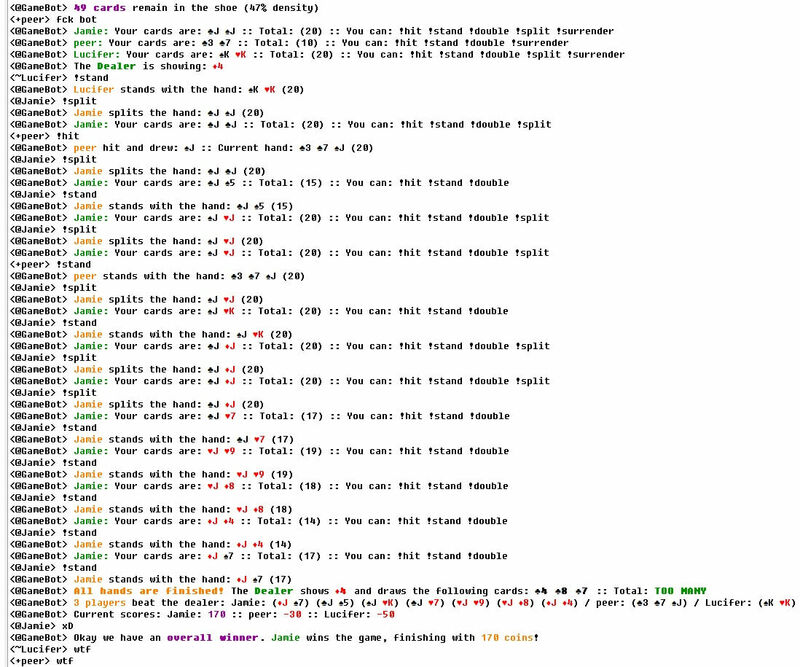 This game was made with the purpose of being a fairly robust solution to blackjack on IRC, but only as a base. The script uses the information saved in external files to calculate statistics, so "using coins to buy items" would effectively damage the statistics. I did try and make the script as clear as possible, divided into sections, so that you can navigate your way around and either add or extend functionality. However, I added a couple of global functions at the bottom of the script to help you along. returns the number of coins this user has in his "coin bank". 0 is returned if no coins are found, whether the user exists or not. deletes N coins from nickname specified, even if nickname doesn't yet exist. works as above, but returns the new number of coins AFTER taking away N coins. So i guess like this, it can help tie together external scripts which make use of the saved coins. I'm using windows 8.1 but a really old version of mIRC for the bot, but everything is working fine now. Thanks for being so diligent on updates, this is probably one of the best games on this entire site, and I've been here for YEARS. Works great! Nice game play and options. We're having lots of fun playing this.